Generally I review fiction books by indie authors. This week I read a book of Biblical teaching that I found exceptionally enlightening yet somewhat difficult to read. Difficult in that it shatters many of the things that I believed and opened my eyes to the insidiousness of the dark side and how it has infiltrated Western theology. 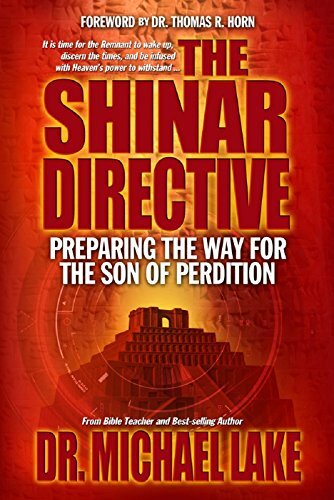 The Shinar Directive exposes the tactics of the dark side including the occultic Luciferian Elite who have been generations in the planning for the appearance of the Antichrist. You have to be prepared to hear truth in it’s grittiest raw form if you are going to read this one. It is the first of three this author is publishing. The third in the series isn’t published yet. In this book you learn how the church has been infused with the pagan practices of Babylon, the role of mystery secret societies, how the Luciferian Elite control world events, how our society is being manipulated, the extent of mind control, the role of transhumanism, and much more. The Shinar Directive is meant to help wake up sleeping Christians to be be the Remnant and victorious church in these last days before the end times of prophesy. The topics covered are well researched and presented in a way that is easy to understand. There are diagrams and images that I had to take a magnifying glass to in order to make out the words. But even if you don’t go into the pictures and diagrams you will gain an understanding from the text. There were just a few copy edit errors that I had to correct in my mind, but they very were few and did not create any confusion in the reading. An excellent read for the serious Bible student and Christian seeking to know more about Bible prophesy. Eye opening and thought provoking. I highly recommend this book to all believers in Jesus. It is time to know what the enemy plans so you can be ready in your spiritual walk. On to the next book in the series. I am a retired grandmother and amateur quilter. Generally I do not discuss religion and politics with people other than my family and even then I do more listening than talking. Because I dislike confrontation this blog is a way for me to express opinions that I hold on these and other issues without having to delve into controversial discussions with others who may not agree with me. I am also an avid supporter of indie authors. There are a lot of great books that are not available through traditional publishing and I believe that these stories need to be brought to the attention of the reading public. This entry was posted in Book Reviews and tagged Book review, Christian religion politics and faith controversial issues, Christianity, Dr. Michael Lake, End times prophesy, end times signs, God, mind control, Mystery Babylon, secret societies, spiritual warfare, The Shinar Directive, transhumanism. Bookmark the permalink.